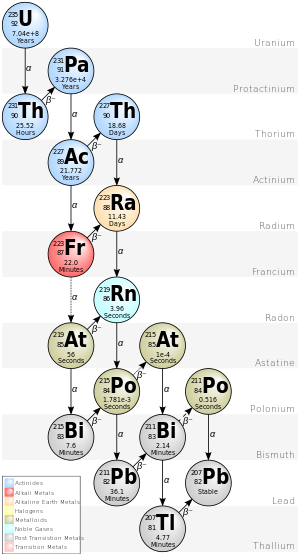 All the elements and isotopes we encounter on Earth, with the exceptions of hydrogen, deuterium, helium, helium-3, and perhaps trace amounts of stable lithium and beryllium isotopes which were created in the Big Bang, were created by the s-process or the r-process in stars, and for those to be today a part of the Earth, must have been created not later than 4.5 billion years ago. All the elements created more than 4.5 billion years ago are termed primordial, meaning they were generated by the universe's stellar processes. At the time when they were created, those that were unstable began decaying immediately. All the isotopes which have half-lives less than 100 million years have been reduced to 0.0000000000028% (6988280000000000000♠2.8×10−12%) or less of whatever original amounts were created and captured by Earth's accretion; they are of trace quantity today, or have decayed away altogether. There are only two other methods to create isotopes: artificially, inside a man-made (or perhaps a natural) reactor, or through decay of a parent isotopic species, the process known as the decay chain. Unstable isotopes are in a continual struggle to become more stable; the ultimate goal is becoming one of the 200 or so stable isotopes in the universe. Stable isotopes have ratios of neutrons to protons in their nucleus that start out at 1 in stable helium-4 and smoothly rise to ~1.5 for lead (there is no complete stability for anything heavier than lead-208). The elements heavier than that have to shed weight to achieve stability, most usually as alpha decay. The other common method for isotopes of the proper weight but high neutron to proton ratio (n/p) is beta decay, in which the nuclide changes elemental identity while keeping the same weight and lowering its n/p ratio. Also there is an inverse beta decay, which assists isotopes too light in neutrons to approach the ideal; however, since fission almost always produces products which are neutron heavy, positron emission is relatively rare compared to beta emission. 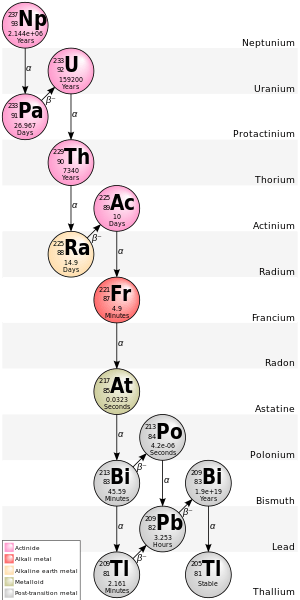 There are many relatively short beta decay chains, at least two (a heavy, beta decay and a light, positron decay) for every discrete weight up to around 207 and some beyond, but for the higher weight elements (often referred to as "transuranics", but actually used for all isotopes heavier than lead) there are only four pathways in which all are represented. This fact is made inevitable by the two decay methods possible: alpha radiation, which reduces the weight by 4 atomic mass units (AMU's), and beta, which does not change the weight at all (just the atomic number and the p/n ratio). 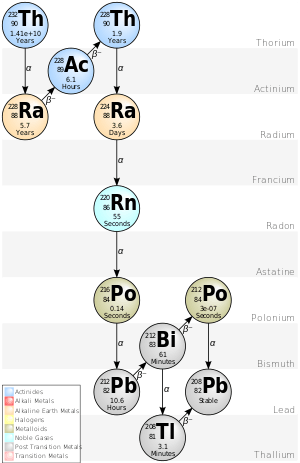 The four paths are termed 4n, 4n + 1, 4n + 2, and 4n + 3; the remainder of the atomic weight divided by four gives the chain the isotope will use to decay. There are other decay modes, but they invariably occur at a lower probability than alpha or beta decay. Due to the relatively short half-life of its starting isotope neptunium-237 (2.14 million years), the fourth chain, the neptunium series with A = 4n + 1, is already extinct in nature, except for the final rate-limiting step, decay of bismuth-209. The ending isotope of this chain is now known to be thallium-205. Some older sources give the final isotope as bismuth-209, but it was recently discovered that it is radioactive, with a half-life of 7026599594400000000♠1.9×1019 years. There are also non-transuranic decay chains, for example those of magnesium-28 and chlorine-39. On Earth, most of the starting isotopes of these chains before 1945 were generated by cosmic radiation. Since 1945, the testing and use of nuclear weapons has also released numerous radioactive fission products. Almost all such isotopes decay by either β− or β+ decay modes, changing from one element to another without changing atomic mass. These later daughter products, being closer to stability, generally have longer half-lives until they finally decay into stability. Since the heavy original nuclei always have a greater proportion of neutrons, the fission product nuclei almost always start out with a neutron/proton ratio significantly greater than what is stable for their mass range. Therefore, they undergo multiple beta decays in succession, each converting a neutron to a proton. The first decays tend to have higher decay energy and shorter half-life. These last decays may have low decay energy and/or long half-life.